Removing odors from your clothing can be difficult because certain stains (looking at you, urine and tobacco!) emit a really strong smell which can mix with your detergent, merely making cleaning a less than sufficient job – you also need to deodorize, making it necessary to remove odor from clothes to save you from embarrassment! Chemical fragrances, cleaning agents, body sweat, and other potent scents can get caught into the fibers of the materials you wear, making it necessary to remove odor from your clothes to save you from potential embarrassment. Thus, knowing how to remove detergent smells from your clothes when the laundry detergent smells too strong can also be necessary- especially when these smells mix up with sweat or perspiration. Some detergent companies use incredibly strong masking agents which ultimately end up making your shirts smelly and uncomfortable. Also, your laundry can still smell bad after washing! It’s annoying, but it’s true- especially when the weather doesn’t cooperate and makes your clothing musty. If you keep on facing these problems, you can try to find solutions using laundry tips you see on Pinterest and odor removal blogs from so-called experts, but so often these “remedies” fall short. The point here is that life is full of odors. Even when you do your laundry well it can still smell which just emphasizes the need to remove odor from clothes completely. 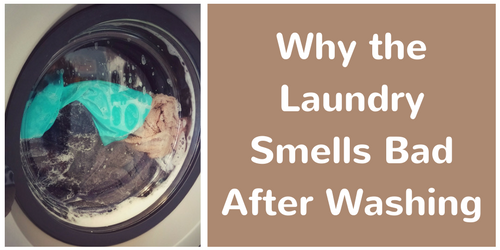 You might be wondering why, sometimes, your laundry smells bad after washing. Isn’t the point of having a washing machine so that your fabrics don’t stink? Rest assured, you are not alone, as many people experience this frustration daily. The most common reason as to why the laundry smells bad after washing is due to your laundry not being given enough time to dry out. Seems like an easy fix, right? Yet, as a result, your shirt and pants may look clean, but a lingering musty smell may be present which, when mixed with strong chemicals (like perfume or some other masking agent), can make it even more smelly and obnoxious. Ultimately, you need to learn how to remove odor from clothes, especially in cases like these, where your laundry smells bad even after washing. In this regard, the solution is usually pretty simple: you can often neutralize or eliminate the odor by drying it out properly the next time you do the laundry or by using a variety of products which can neutralize tough smells. Of course, we recommend the OdorKlenz Laundry Additive! What if the Laundry Detergent Smells too Strong? We are taught that one of the best ways to remove underarm stains and smells is to use laundry detergent which, frankly, sometimes smells too strong to remove odor from clothes! Stains might be gone, but the chemical smell left behind is not always worth it. 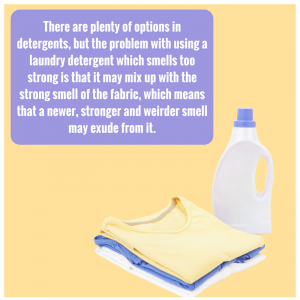 There are plenty of options in detergents, but the problem with using a laundry detergent which smells too strong is that it may mix up with the strong smell of the fabric, which means that a newer, stronger and weirder smell may exude from it. So, what are you supposed to do? According to some laundry tips for odor-removal, you need to remove odor from clothes first (before using strong detergents), and ideally, baking soda and vinegar can help you do the trick. For mild smells, this may well work! However, if you have already washed your clothes in a too-strong detergent and you are having trouble getting that chemical odor out, OdorKlenz Laundry Additive will get it done in one go! Laundry tips are all over the internet. 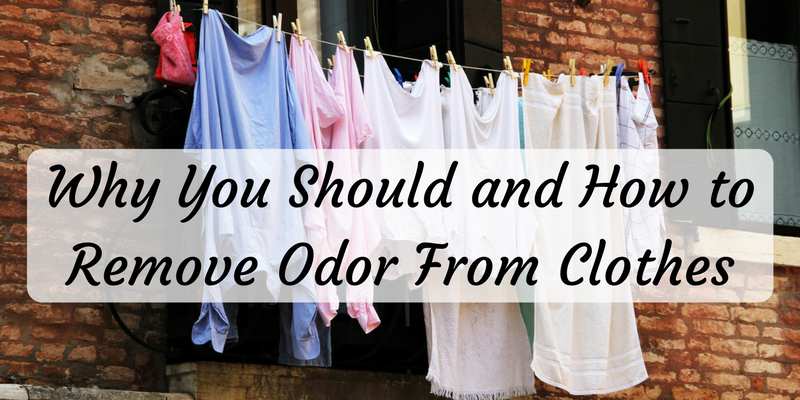 From blogs to news articles, you can easily find advice for odor removal. It seems like the most common opinion takes for granted that stain removal equals bad-smell removal. Often, a cleaning blogger indicates that you need to get rid of the stubborn stain to make your clothes smell good, but some odors may linger longer than the stains! Getting rid of dirt and grime is excellent, but invisible aromas can be more stubborn than spots – especially on your gym clothes or other high-use items. Fortunately, you can use a neutralizer to remove strong odors or fragrances from your clothes. Internet “experts” may overlook the value of a true odor eliminator, but actual research made by experts shows that to get rid of malodors you have to tackle them at the molecular level. Fortunately, because of the work of companies like OdorKlenz, you can expel the smell of different types of odors using a product at home or those available on the market. With the help of conventional laundry tips and an effective product for odor removal, you will be able to look your best and smell great at the same time! Having unwanted odor on your clothes after washing can become frustrating, especially if you have placed hard work, money, and effort into thoroughly cleaning them. Something many people overlook is the importance of reading the instructions carefully. Failing to do so can mean that you are misusing the product. Too much detergent or fabric softener can lead to buildup which can damage your clothes and, yes, end up smelling too strong. Too little will be ineffective at both cleaning and deodorizing. Laundry, like all chores, takes some planning and you may be implementing incorrect or inefficient strategies for washing clothes, fabrics, and the like, which is just an unnecessary frustration! Why should you have to ask an expert for advice on something so simple? Luckily, OdorKlenz Laundry Additive helps you avoid the perils of too much detergent and the stinky pitfall of too little. 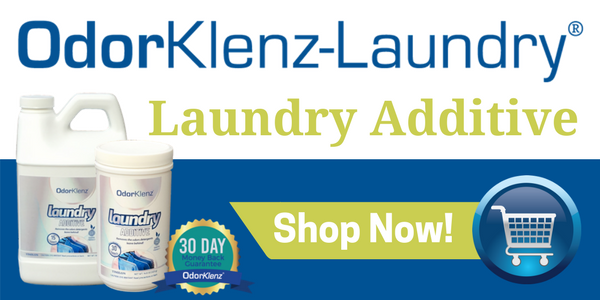 To remove unwanted smells from your clothes (including the detergent smell itself), just add some OdorKlenz to the wash and project confidence as you wear your clothes free from odor!